There’s lots of action during the fall “Mack Attack” atop Cedar Key’s Seahorse Reef. There’s no doubt in my mind that the small islands that we now generally refer to as “Cedar Key” was once the upper end of a ridge of land that stretched well southwest into the Gulf of Mexico. But eons of time and moving water have worn down that peninsula, and it’s now mostly submerged, save for just those few small islands. The lighthouse atop Seahorse Key now warns mariners of dangerous shallows, but the remnants of the ridge, Seahorse Reef, still stand submerged for another ten miles towards the Gulf. And it’s that ridge, grassy in places and adjacent to deep flowing water, which is of interest to Big Bend anglers as cool weather approaches. Cool weather causes a feeding frenzy for many Gulf species, especially Spanish mackerel. If you’ve never noticed it, Spanish mackerel do only one thing all spring and summer. They eat. And it’s those better-fed and big fall fish that are attracted to the baitfish that gather on and along Seahorse Reef, especially at a place known as “The Hook”. The Hook is about a mile northeast of the Steel Tower that marks the navigable tip of the reef. It’s a place where twenty-foot water collides with ten-foot water, bringing bait to the top of the bar. There, Spanish mackerel feed voraciously, hoping to fatten up for what they expect to be frigid weather ahead. There are a couple of ways to fish The Hook, but first be aware that the trip from the ramp in downtown Cedar Key out the Main Ship Channel can be a rough one, especially if it’s breezy. I’ve seen small boats there, bobbing like corks, but I’ll stick to recommending that this is a place better suited to bay or high-sided offshore boats. Once there, start trolling, paying attention to the edges of the bar. If the tide’s rising, you might even try trolling the crest of the reef for a couple of miles back towards the lighthouse at Seahorse Key. Keeping the lighthouse off your bow and the Steel Tower off your stern will keep you oriented. 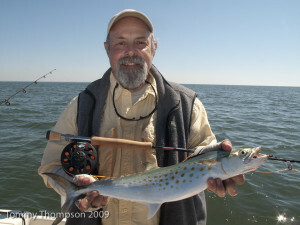 Trolling for Spanish mackerel is easy. Rig the business end of your medium-weight outfits with a swivel, a short trace of wire and either a #00 Clarkspoon (Don’t forget the red bead!) or a bright yellow Flowering Floreo jig tipped with a strip of mullet belly. I salt strips of mullet belly during the summer and freeze them for the sole purpose of mackerel fishing. The salt toughens the strips, making them good for more than one strike. Using either rig, put out a couple of lines and set your boat’s speed to about 4 knots. You’ll find that quickly “working” your bait forward and allowing it to fall will attract more strikes, usually as the bait is falling. While this area is highly regarded as a spot for Spanish mackerel, there are also other species here. Expect to find big bluefish, ladyfish, and even a small king mackerel. Also, if you anchor up, set out with some Baitmasters’ chum, and toss a D.O.A. shrimp into the slick, you’ll likely do as well as folks who are trolling—so long as the tide is high.